As the 2011-12 season drew to a close one of the inevitable topics among Swans’ fans, and football supporters in general was undoubtedly the cost of following your team. With Premier League away tickets often costing £40 to £50 the price of success is often felt where it hurts – in the pocket. 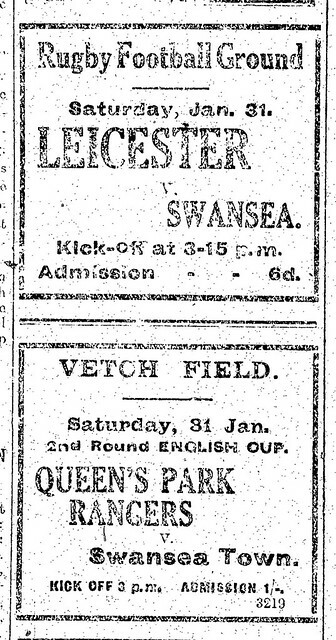 Yet even these days there would be a shock if the Swans were to double the admission price for a special home game – and that’s exactly what happened in January 1914. Having narrowly failed to add promotion to the Welsh Cup in their first ever season, Swansea Town were obviously hoping to add yet more glory in their second campaign at the Vetch – and although once again the great prize of promotion was to elude them it was the F.A. Cup – usually known in those days, and not just in Wales, as the English Cup – which captured the imagination of supporters and the press. Swansea Town entered the competition in the Preliminary Round, as they had no record in the Cup to draw on, and though it is very hard today to trace all the results it seems that the Swans had won no fewer than seven ties when, having beaten Merthyr and become the first Welsh club to reach Round 2, they were drawn against Queen’s Park Rangers who were in the Southern League Division 1. Excitement was high in the town as this represented the last 32, equivalent today to perhaps a Conference club reaching Round 4 and mixing it with the Premier League giants. But before the game could be played there was the controversy of the “gate” money! On the Wednesday before the game the South Wales Daily Post’s London correspondent reported that confidence in London about QPR progressing had taken a blow with a heavy defeat at West Ham the previous Saturday, though Rangers were fielding a full strength side apart from their “brilliant winger, Jones” who was injured. They would travel to Swansea on the Friday accompanied by up to a thousand supporters on a special train concerned at facing a side who had already accounted for two Southern League First Division teams. In Swansea, however, talk was all of the increase in the ground admission from 6d to one shilling – a 100% rise! 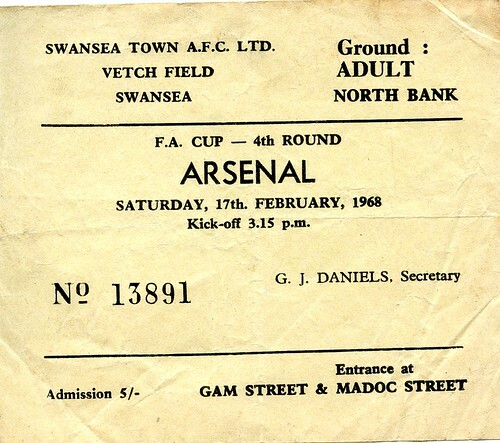 Costs had apparently almost doubled from the Swans’ first season, wages and ground improvements having taken their toll – remember a turf pitch and a grandstand had appeared at the Vetch for that second season. Merthyr and Llanelly were apparently struggling financially and the Swans’ directors did not want to waste the chance to pay off some debts. The supporters were less impressed and their letters were summarised in the Post. Some alleged that it was the fault of the visitors and pointed out that Merthyr had only charged 6d when QPR had visited in the League. “Gougho” suggested supporters would rather go to watch the rugby than part with their shilling, but “Soccer” pointed out that the directors had not agreed to switch the game to Rangers’ Park Royal ground, where the gate charge would have been a shilling anyway and Swans would have forfeited the ground advantage. So what else could these indignant letter writers have done for entertainment that week? Well, there was a huge range available in those days before radio and television. The Cinema was still in its infancy with silent movies which were mostly on a single reel, so if you went to the cinema you had a full bill of entertainment rather as you would have had in a variety theatre or music hall. Prices ranged from only 3d up to a shilling for the best Circle seats. These advertisements give just a few of the choices; “In Peril of the Law” a “sensational melodrama 3,100 ft in length” at the Castle sounds as if it might have equalled a cup-tie for thrills and there was orchestral music too – which you certainly wouldn’t get at the Vetch. At the Vetch your controversial shilling would only have paid for a view in the open on an earth bank. In Oxford Street however you could enjoy the palatial luxury of Swansea’s newest cinema, the Carlton. This stunning building, which Swansea residents still know well as the home of Waterstone’s bookshop, boasted 900 seats on “sumptuous premises” with “no pillars to obstruct the view”. Built in a Renaissance style it had cost £20,000. Again there was an orchestral band, it boasted concealed lighting, and the best seat in the Circle would have cost you just the shilling the Swans were demanding for the QPR tie. If your interests were more educational you might have been tempted by the illustrated lecture on Scott’s fatal polar expedition. On Thursday that week a “large audience” at the YMCA’s Llewellyn Hall building was “thrilled” by a talk by Mr Frank Wild, who had been a companion of Scott’s on earlier expeditions and was due to accompany Sir Ernest Shackleton on his attempt to cross the Antarctic continent. The lecture was accompanied by “limelight and cinema views” and due prominence was given to the heroism of local man Edgar Evans who had died with Scott. Though how much you’d be able to see by the end of a 3.15 kick off at the end of January is doubtful – no limelight or concealed gas mantles at St Helen’s! A final alternative was absolutely free. The controversy over Votes for Women was at its height and at the Junior Imperial League, Castle Buildings on Monday a debate was scheduled between pro and anti Women’s Suffrage speakers. The organisers must have bee aware of the Cup-tie gate controversy, because they billed their event as a “Great Suffrage Tie” with Alderman David Davies as “Referee” and a guarantee of “No Gate Money Charged”! Friday’s Post contained a long letter from the Swans’ Chairman Mr Frank Newcombe justifying the price increase. “No match of the same importance has been played in South Wales before” he claimed. “The contest for the English Cup is everywhere recognised as THE EVENT OF THE SEASON.” Further worrying news for Swans’ supporters was the price paid for a 2-1 victory at Oswestry in the Welsh Cup on Thursday. Captain Jack Nicholas was injured and would not face QPR; while the directors (not the manager in those days) had to decide between the claims of Messer and Mayo for the right wing spot after some disappointing recent performances. If Swansea Town won they would be the first ever Welsh club to reach the Third Round and the Daily Post reflected the excitement by printing a picture of the “doughty” Rangers team, champions of the Southern League only the season before last. After all this it was perhaps inevitable that the match itself turned out to be a bit of an anti-climax. The price increase possibly kept the attendance down a bit – at 14,000 it was the third highest of the season after previous cup ties against Merthyr and Cardiff City, who presumably attracted a larger travelling support. The record gate takings for a football match in Wales, £770, presumably justified the directors’ decision. On the field, though, the absence of Nicholas and what seems to have been an all round nervous performance did not help and Rangers won 2-1 despite Swansea taking an early lead – a disappointment but not a disgrace. “Ajax” felt that “the Swans form was the poorest they have shown in the whole English Cup series” and that if they had played as well as they had against Cardiff and Merthyr the result might have been different. The Swans did not lack effort but their passing and combination play was inferior to QPR; the degree of disappointment reflected in the press reports, however, emphasises just how far the Swans had already come. You can read the press clippings here. Newsreels of Swansea Town in the FA Cup 1950s and 1960s. Newsreel footage of Swansea Town FA Cup and Welsh Cup matches from the 1950s and 1960s. Along with reaching the promotion play-offs in Division Three, victory in the third-round of the F.A. 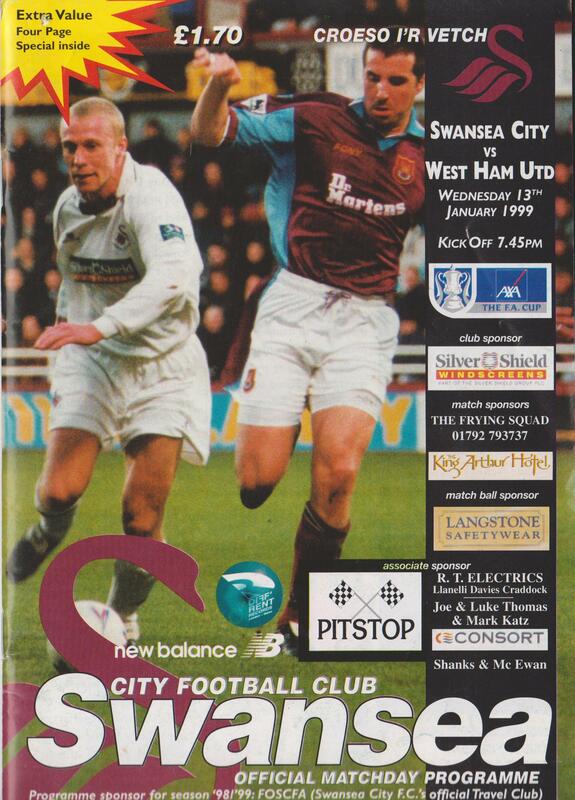 Cup against West Ham United was arguably the most memorable moment of the 1998/1999 season for Swansea City. The announcement that Swansea was to play West Ham in an away fixture had sparked excitement around the city. A cup tie against the Premiership side was well deserved after two strong victories in the previous rounds against Millwall and Stoke City. Due to the huge gulf in divisions, it was a game in which the pundits expected Swansea to be easily brushed aside by West Ham. Biographer of Swansea City FC, David Farmer, said that ‘had the Swansea supporters travelled to Upton Park believed all they read in the papers, they would not have bothered to go’. Such opinions from experts however did not put off a small army of loyal supporters with high hopes travelling down to London. Despite being outnumbered, the Swansea fans were able to offer great vocal support which aided their team to unexpectedly outplay their famous opponents. Patriotism and pride was also displayed by the manager John Hollins who carried out his away match habit of placing a Welsh flag in his dugout. Unfortunately for the Swans, a Hammers equaliser that goalkeeper Roger Freestone could have prevented ending up in the back of the net made the score 1-1 at the dying stages cancelling out Jason Smith’s earlier goal and denying them a famous win at Upton Park that their endeavours deserved. The replay at the Vetch Field however, was to result in an illustrious giant killing with Swansea making history by becoming the first bottom division team to defeat a Premiership club in the F.A. Cup since the re-organisation of the league structure in 1992. A full capacity crowd had packed into the Vetch carrying the belief that something special could happen. Providing an abundance of loud Welsh voices, the supporters created an intimidating atmosphere hoping to help carry their team on to a well fought win. Many fervent fans had queued outside the Vetch a week in advance eagerly hoping to get hold of match tickets. On the date of the game the rain had also lashed down upon the pitch all day providing the ingredients for a lively encounter. Harry Redknapp’s West Ham was able to boast a team with a wealth of talented players which included the likes of Rio Ferdinand, Frank Lampard and also Swansea born John Hartson. Such big names however counted for nothing that night as Swansea produced another brave team performance and this time overcame the Premiership side. Both sides played fast paced football that was end to end creating an enthralling cup game. West Ham showed their Premiership qualities early on with Lampard in particular demonstrating his flair. However, it was Swansea midfielder Martin Thomas who was to be the man who made the headlines that night by producing a handful of impressive chances throughout the match, one being an in swinging free kick that rattled against the post. It was Thomas’s next effort though that was able to put the Swans ahead against their London opponents. His goal came on the 29th minute through an outstanding volley from twenty yards out that swerved manically to trick Hammers goalkeeper Shaka Hislop who could do little to recover from his error and palmed the ball into his net. The entire stadium erupted into a state of euphoria as Swansea demonstrated why the F.A. Cup can be so magic, with minnow clubs being given the opportunity to accomplish the unexpected by overcoming teams considered superior. Extraordinarily, Thomas was able to play despite being in pain from a broken knee cap caused by an earlier challenge. Freestone had to be at his best throughout and was able to make amends for his error at Upton Park by tipping away Neil Ruddock’s vicious shot from outside the box late in the second half to preserve Swansea’s slender lead. It was a save that Martin Thomas described as ‘the best save’ he had ‘ever seen’ and it brought two Swansea players to their knees in relief while the fans had their hearts in their mouths as they feared a repeat occurrence of the away tie. Despite West Ham’s impressive work rate, they proved unable to break down a Swansea side that had played out of their skins and had defended valiantly to hold on to their lead. 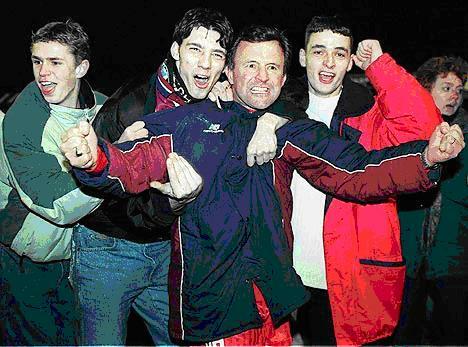 Manager John Hollins celebrates him team’s famous victory with some elated fans. Photo copyright of Daily Mail Online. John Hollins was successful in orchestrating a shock upset by defeating West Ham’s star studded team to set up a fourth round tie against another Premiership side, Derby County. Once the final whistle was blown, some ecstatic Swansea supporters who were eager to celebrate a well deserved win with the players clambered onto the pitch. Hollins was overjoyed with his team which he was said to have written off earlier in the season claiming them not to be good enough for the Third Division. In a post-match interview with ITV, he stated that for him personally, the victory was his ‘greatest cup moment’. For Swansea City itself, the giant killing of West Ham United is without a doubt one of the club’s proudest F.A. cup memories.